The “gorilla” was actually a zookeeper in an unimposing costume. 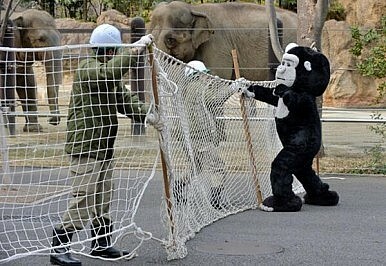 Visitors at Ueno Zoo in central Tokyo were treated to a biennial spectacle yesterday, as one animal handler donned a cartoonish gorilla costume and staged an elaborate “escape” meant to keep staff sharp in the event of an actual breakout. The handler, Natsumi Uno, was wrangled with nets and shocked with pretend “stun guns” – but she told reporters that it was an enjoyable role reversal. Some were quick to question the effectiveness of the drill, pointing out that an actual mountain gorilla – which can grow to six feet tall (1.8 meters) and 485 pounds (220 kilograms) – wouldn’t be captured nearly as easily as the comparatively small Japanese woman in a gorilla suit. Ueno Zoo, the oldest zoo in Japan, covers an area of roughly 35.2 acres (14.3 hectares) the heart of downtown Tokyo’s shitamachi, or “low city” area. Ueno, itself a major stop on Tokyo’s Yamanote train line, is a cultural center that boasts museums, a concert hall and the famous “Ameyoko” market. The zoo features more than 2,600 animals from 464 different species. Due to the zoo’s close proximity to a busy pedestrian center, being able to protect the public from an escaped animal is paramount – even if the drills elicit more laughs than praise. The drill also doubles as an earthquake preparedness exercise. A macaque, native to Japan’s Aomori Prefecture, escaped from the zoo in 2010. It was captured within six hours and without incident. Only four animals have escaped in the last 50 years. The Japan Times recommends winter as the perfect time to visit Ueno Zoo and other wild animal parks around Tokyo, stating that some animals – including giant pandas – are particularly active in cold temperatures.